I spent this past year visiting many rock art sites all over the Colorado Plateau and took thousands of photos along the way. 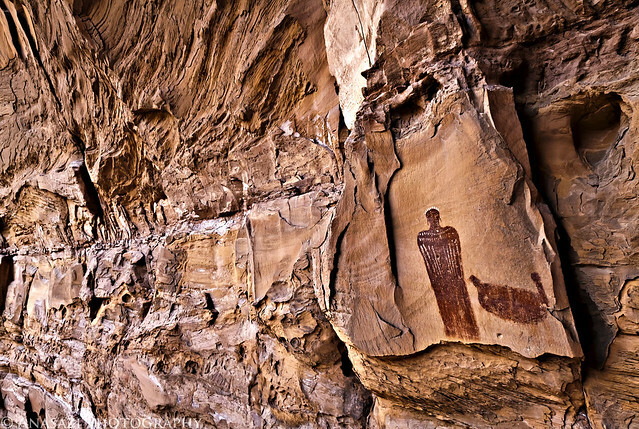 I’ve decided to try and pick out my top ten rock art photos and post them here including a short story about each. I’ve had a great time searching for, learning about and photographing these sites, and I’ve also made some new friends along the way. 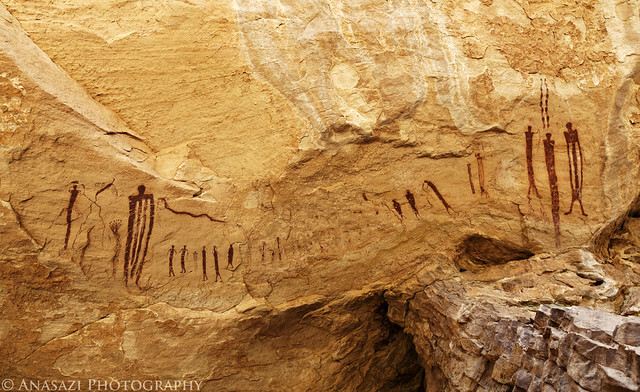 I started this rock art blog back in June to display some of my rock art photos along with some information about each, and have posted a new photo every weekday since then. I have since realized that I just don’t have the time to keep up that pace, so I will be slowing it down a bit starting now. Doing so will allow me to focus on quality instead of worrying about quantity. This will be my last post of the year 2011, but watch for plenty of new photos starting after the first of the year. While the photos in this list aren't really in any particular order, this photo is probably my top favorite of them all. When we went back to Dinosaur National Monument in October one of my main goals was to photograph the panels at McKee Springs again since they are some of my favorites. I had originally planned on driving up there the following morning to try and catch the sunrise, but we finished early in the park and went up there for sunset instead. It was a good thing, because the conditions for photography were just excellent. I love the way the setting sunlight strikes this panel and I couldn't have asked for a better sky. I'm glad that my original plans didn't work out! 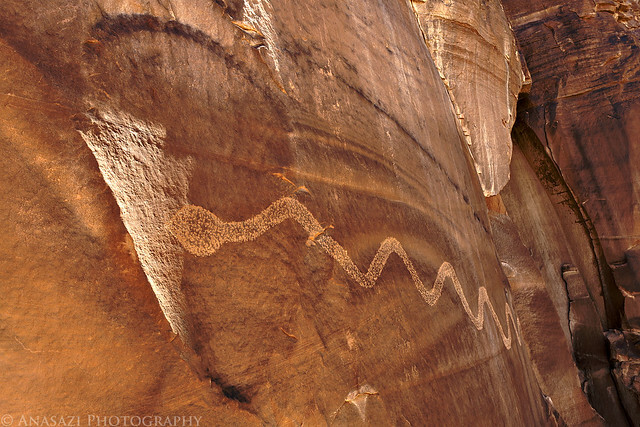 The Solstice Snake is another photo right at the top of my list for 2011. 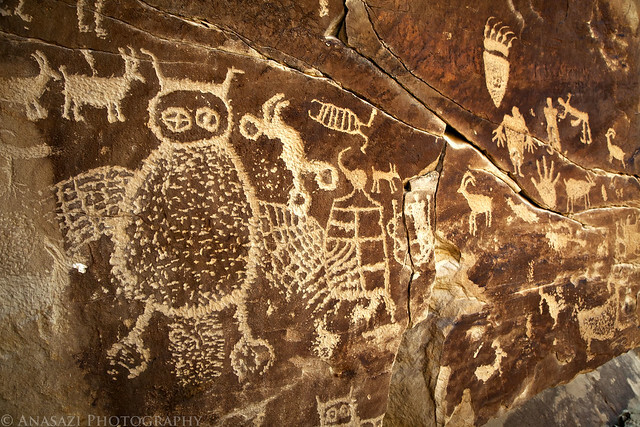 Trying to take this photo was a goal I made early in the year, before I even knew where this petroglyph was located. I spent a lot of time searching for this site and managed to find it before the summer solstice. Then I had to make the long hike in the heat of the summer and hope that the weather would cooperate. In the end everything worked out great, and I managed to make the image I was after. Besides making the image I was after, during the search for the Solstice Snake I also managed to make a good friend and hiking partner who shares the same interest in exploring and rock art. Unlike the Solstice Snake above, I made this image while trying to get something different. I was determined to make a star trail photo with the Moab Maiden, but things were just not working out that great. While we were up there at night taking long exposures for the star trails I decided to take a few shorter exposures for pin-point stars, too. When I got back home and looked through my photos, I ended up liking this one better than the ones with star trails. 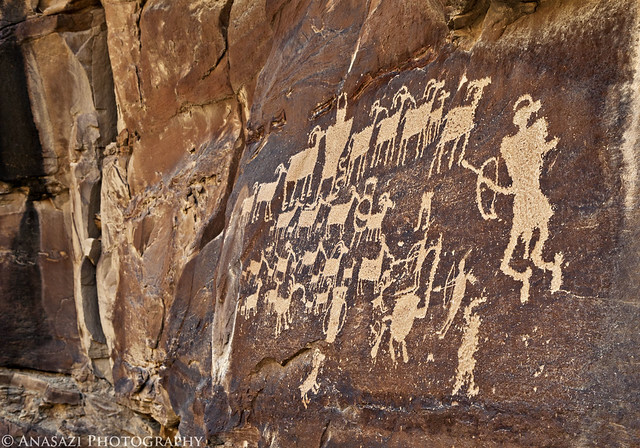 The Great Hunting Scene near the confluence of Nine Mile Canyon and Cottonwood Canyon is probably one of the most well-known and often photographed petroglyph sites around. I have visited the panel a few times, and while we were visiting Nine Mile Canyon again this last May I tried to get a new perspective of the panel and this is what I came up with. I like how this photo shows more of the alcove to the left of the panel and isn't your typical straight-on shot...which I usually try to avoid anyway. 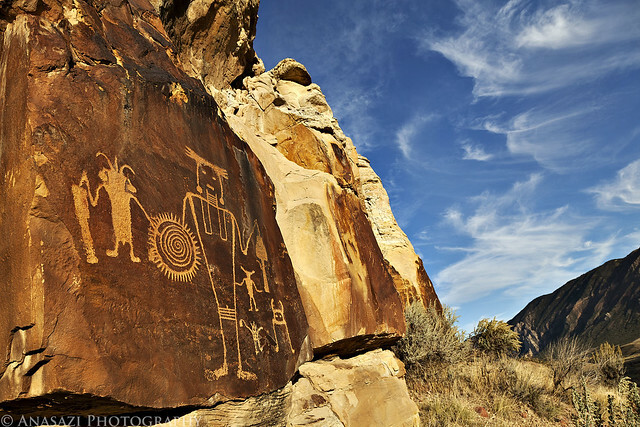 I stopped at this beautiful pictograph panel near Hog Springs again in April on my way from The Maze to Cedar Mesa. It was a relatively quick stop since we were short on time, but I managed to make quite a few images I was happy with while we were there. 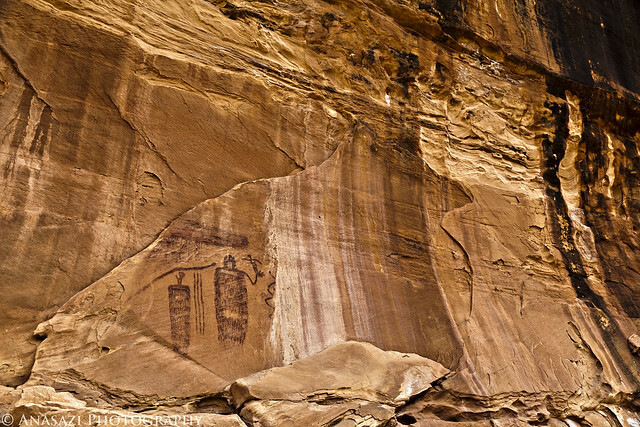 This is my favorite of the set and I love how the image portrays the setting of these pictographs in the back of a massive alcove. On my second visit to Nine Mile Canyon this year I was finally able to locate the large owl petroglyph I had been searching for for a while. Not only is the owl very interesting, but all of the figures on this panel are very cool. I found this panel first thing in the morning and took this photo while I was all in the shade. I had hoped to return closer to sunset to see if I could photograph it in the sunlight, but I arrived about fifteen minutes too late. Maybe that can be one of my goals for 2012? I have wanted to revisit the Peekaboo Panel and explore more of Salt Creek Canyon for the last few years, but the road into Salt Creek and Horse Canyon have been closed every time I try to go because of washouts. I have been constantly checking and it doesn't seem like the road has been open for over a year at this point. I finally got tired of waiting when I visited the Needles over Labor Day weekend and decided just to hike in. This was one of my more memorable hikes of 2011, but unfortunately for all the wrong reasons. I got very sick during this hike and had a hard time making it back to my Jeep on my own. It was certainly no fun, but I did manage to get some good photos at Peekaboo before having any troubles. While waiting to meet my friend Philippe in the San Rafael Swell this summer, I spent some time revisiting the Transformation Scene Panel. I can remember just sitting an examining all the details found in this panel. When I took this photo I was laying on my back to get the angle I was looking for, and I think it turned out great. It was also unknown at this time that Philippe and I would discover a new Barrier Canyon Style site the following day! Our hike down to The Green Mask Alcove was my first trip into the Grand Gulch area. It was a great hike and there was a lot to see and photograph along the way. I'm looking forward to spending much more time exploring Grand Gulch in the very near future. It is actually one of the reasons I am planning on starting backpacking in 2012. 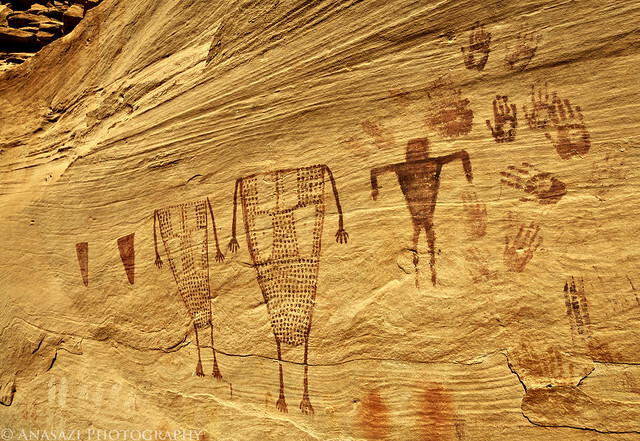 The Snake-in-Mouth Panel is another of my favorite rock art sites found near Moab. After hiking to the Yellow Comet Panel with my friend Jackson, we still had plenty of daylight so I brought him up to this site so that I could get some new photos. This is one of the first photos I took that included a large part of the large alcove that the rock art is found in, but it certainly wouldn't be the last since I like how this kind of photo shows the overall setting. 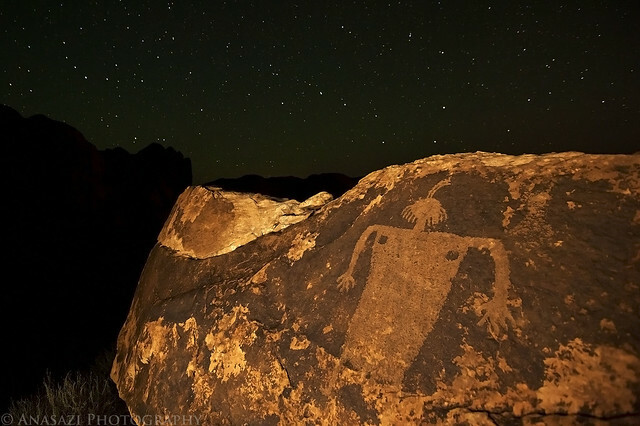 This photo has definitely helped shape my 'style' when I try to photograph new rock art sites. 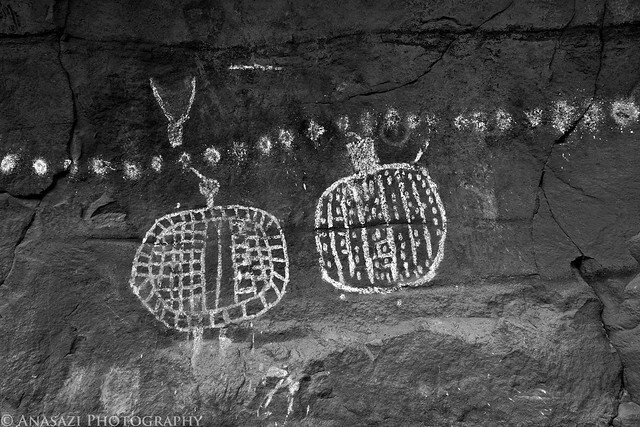 I’m looking forward to taking many more rock art photos in 2012, so feel free to add this blog to your RSS reader if you would like to follow along. Happy New Year!